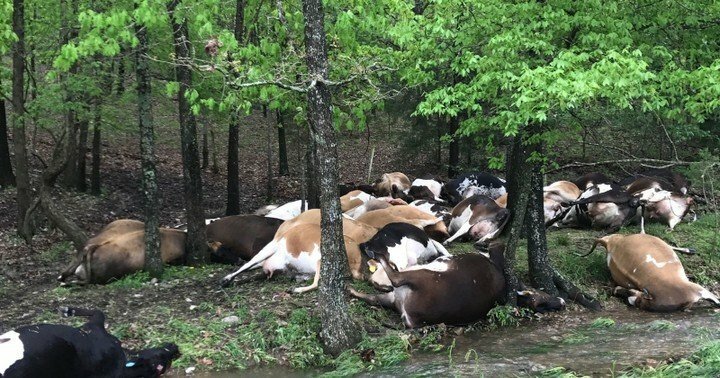 Farmer Loses 23 Cows to Thunderstorm. Residents of Kajola in Ogun State trooped out in their numbers to fetch meat freely after a train killed 10 cows. It was 'meat for all' in Kajola Community in Ogun State on Friday, November 16th after a train crushed 10 cows. Residents counted their blessings, as they freely 'fetched' beef from the 10 cows. Men and women including commercial motorcyclists and passersby used knives, cutlasses to cut from the lifeless cows. Some of them took home meat that could last them till Christmas. The train, which took off from Lagos, headed for its final destination, Kajola Terminus, when it ran over the cows which were crossing the rail track at 11.50 a.m. The herders seemed to be caught unawares, as residents helped them ensure the meat did not waste. Residents told the News Agency of Nigeria that the herders had been warned to desist from bringing the animals near the track. They also said that the meat would waste if people didn't take them. One of the residents, Mr Adeola Paseda, said he got beef that would be enough for his family. “I am one of the residents that got here first. I have meat that can last for a week,” he said. Mrs Bola Akanni, who was carrying a basin of beef, said: “Times are hard now; if we do not take the meat, it will amount to waste of an opportunity". Mr Fatai Akeem, said he was alerted by his friends immediately the accident happened. "I watched as people cut meat in basins and took them to their houses. "The herders lost a lot because they could not listen to advice not to bring cows near the rail track,” he said. NAN reports that pieces of beef littered the track as the residents continued to fetch the beef. Why Are Nigerians Flocking To Canada?